What is different about your bodywork? My Reboot ™ sessions are the deepest and most transformative bodywork around. Each session is 2 to 3 hours. The current session fee is $190.00 Please wear yoga clothes or something that moves easily and breathes well, shorts and a t shirt are fine. All sessions are performed clothed on a mat. Think lazy yoga. Clients leave feeling taller and pain free. This bodywork is no joke. If you suffer with chronic pain, back pain, neck pain, carpal tunnel syndrome or sciatica schedule an appointment. This isn’t massage as the public thinks of it. This works. Calling what I do massage does it a disservice. A client recently got a deep tissue massage and compared it to being petted for an hour compared to what I do. It’s not painful but it is deeply therapeutic. My work can be soft and gentle at times but I can use 200lbs of body weight should I need to. Over time those in chronic pain, athletes, yoga instructors and dancers seek me out. My work is relaxing but I have a strong resonance with those in chronic pain who need help. You do not have to be flexible or “in shape” to receive my work. Just like any other sort of massage I tailor the work to you and your specific needs. My work is balancing and a perfect chance to escape the aches of modern life and computer user posture. Use my online scheduler here. Yes. Outcalls within 30min driving time add an additional $40.00 fee. These must be scheduled via phone. If you want to make sure you get your spot a minimum of a weeks notice is best. You can call or text me at 512 905 2298 if you need an outcall. Cash, check or credit card are accepted as payment. Yes, I teach a single class on Wednesday of each week from 630pm-8pm in my private home studio in Round Rock. My classes are small with no more than 6 students and plenty of hands on attention. Recently my work has been less sun salute focused and incorporated elements of yin yoga and self massage in a completely relaxing style that’s suitable for anyone. Sign up for class using in my online scheduler. What massage classes do you teach? Intro gives you a full 1.5 hour mat sequence you can perform on family, friends or clients. With that sequence under your belt we then show you how to use the same sequence on a massage table. For massage therapists this eases the transition of clients from the table to the mat. Any massage therapist who wants to excel and cares about quality education should take my classes. This is not fluff and I’ve put all of my energy into providing dense curriculum that LMTs tell me they’re happy to take twice because it’s so packed with information. Your class fee includes your printed full color spiral bound workbook and digital downloads of the videos that go with class. Table Thai is a 2 day class that focuses on Thai massage on a familiar massage table. This gives additional detail, options and skills to the LMT who wants their practice to excel on the massage table and wants additional options to help transition clients to the mat or allow them a full 2 hour sequence on a table. Your class fee includes your full color printed spiral bound Table Thai workbook and digital downloads of the videos that go with class. Each Phase class is an in depth look at mat based bodywork that I call Reboot TM. Many elements of bodywork are included in addition to yoga and yoga therapy for pain reduction. Each Phase class includes a complimentary 3 hour Reboot TM session with me outside of class. 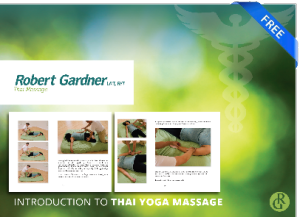 Phase 1 class is 5 days and covers double leg and seated work in Thai massage in addition to yoga and yoga therapy. This is the first class where we really dive deep into Thai massage for the mat and start to build on our scales to truly improvise. The Phase classes are where my work starts to differentiate significantly from traditional Thai massage as we’re blending myofascial release, trigger point therapy, self care and yoga therapy into our work. Where do I sign up for class? You can see our current class listings and register here. If you have a Thai massage mat please bring one. If not bring 3 or more comforters and blankets you can fold up and over 3+ times to allow you cushion for your knees as you work. Wear loose fitting clothes that you can stretch in. Bring a pencil and paper or ipad should you need to take notes. Bring snacks like fruit, nuts and a water bottle that seals well. If class is held in my home studio I often try to prepare lunch for everyone. If not there are many local restaurants within driving distance. I want a Thai massage class in my city and state. Massage therapists often ask me if I can teach in their area. I can but I need the following: 8 students paid in full for any class offering and a facility to teach in. In these instances I often have to file paperwork with another state regulatory board to offer CEs in your state. I can do this for most states given the time and students who’re willing to sign up in advance. I do not teach traditional Thai massage. Traditional Thai massage includes elements that I feel slow the ability of westerners to take on the practice and allow it to flourish in the west and help people. I feel that LMTs are the people who can most easily use the work to help others and develop real mastery from daily use. I am a syncretist and iconoclast. I constantly review my teaching, how I approach education and strive to give the highest quality curriculum possible. All classes are a challenge to myself and push my professional and personal boundaries. The skeleton of my work is based off of traditional Thai massage but I have expanded on it, extended it and include other forms of work in my own sessions and classes depending on the needs of my clients and students. At any given time this may include western anatomy, rehab education, yoga, yoga therapy, trigger point therapy, neuromuscular reeducation, chi nei tsang, myofascial release and pranayama. You can study Thai massage with other teachers but you can only study what I do with me. As an LMT and educator I’m working to change the bodywork industry from the ground up. The things I’ve learned can allow you to work effortlessly and really help symptoms go away for clients with chronic pain and other conditions. I’m a yoga teacher or I’m not an licensed massage therapist. Can I take your classes? I allow anyone who has interest to take Intro or Table Thai classes. Though they are informationally dense I can teach someone off of the street to do Thai massage for family and friends. If you want to learn, I will teach you. Currently state regulatory agencies seem allow people to practice Thai massage under the names Thai yoga or Thai therapy as long as people don’t use the word massage. Keep in mind that if you want to do this long term, above board, you need to go to an established massage school to obtain your massage license in your state. If you do not, over time as Thai massage grows there will be growing fiscal interest in state regulatory boards shutting down those who practice without a massage license. You may be able to skirt the law for now but in time Thai massage will grow and so will the leering eye of regulatory agencies. Currently I require a deposit for classes to hold your space. That deposit is refunded if you cancel within 2 weeks of the start of class. If I cancel class for reasons of my own all fees are refunded asap. Are you an accredited provider for Continuing Education? I’m currently approved in full by the following state massage boards and additional entities. Can I get certified in Thai massage through you? Certification with me will include homework, many practical sessions and notes including sessions with me giving and receiving work. This is no small commitment and I honor your time and energy. If you study with me, we’re not just doing good bodywork, we’re changing the world. I don’t understand, what is this Reboot ™? Out of that I decided it was time to step out on my own, trademark my brand of work (thus the ™) and make a legal distinction about what I practice and why. Traditional Thai massage in the U.S. is in a particularly precarious position due to the number of yoga instructors who are teaching Thai yoga to skirt around massage licensure and laws. In my own experience, I knew that I could not teach yoga instructors beyond Intro and Table Thai to do what I was offering. They do not have a license or the liability insurance to use the deep compressions I will be showing you later in class. Reboot ™ is what I do. It’s not traditional Thai massage. Reboot ™ is an amalgamation of the best bodywork available to the public and allows me to teach more easily to those who can use this work for the benefit of the public. You’ll hear about it more in time as my practice grows. What is Thai massage jam ™? Thai massage jam ™ is something that fell into my lap and an idea that I’ve fostered for 3 years here in Austin, TX. Massage therapists didn’t have any interest in Thai massage and said it looked like yoga. The yoga community mostly had no interest in Thai massage because they said it was massage. No one wanted it except the Austin Acro Community. From a core group we kept getting together each week to share and give/receive in a public, open format where anyone was invited. People still ask me what Thai massage jam ™ is and I tell them it’s Burningman hit massage school. On any given night there are a mix of veterans jammers, new people, giving, sharing, talking, laughing, cuddling and having a wonderful time. You can find out more info using this link. Feel free to follow us on facebook or meetup as well. Long term I’m trying to expand Thai massage jam ™ to your city/state. If you’re interested in that please contact me. Who did you study with? Where did you learn what you do? I’ve had many teachers over the years and I could speak at length about all the influences I’ve had. In this case I’ll focus on massage and not on yoga or other teachers like spiritual ones. My first teacher no longer teaches Thai massage but is a westerner and amalgamated the Thai massage she picked up from teachers in Thailand. She traveled and to the best of my knowledge she studied with Pichest Boonthumme, Chaiyuth Priyasith and Arno L’hermitte of Osteothai fame. My teacher was a syncretist like myself and her combination of techniques was something I studied for years as her teaching assistant and colleague. I’m forever thankful for the foundation she gave me. Walt Fritz PT has had a huge influence on how I look at my work and how I practice. Although his work is table based and initially may seem very different it’s amazingly similar. His focus on pain science and modern research that are client focused threw my work into a clear perspective. For years I’d been trying to figure out how to push my work towards scientific research and not rely on very common but outdated theory related to Traditional Thai massage. In short how do we do our best work maintain good body mechanics and allow it to develop as the research studies question our fundamental assumptions not of what we do but how it actually works to begin with? Do you have workbooks and videos for sale? All of my materials are self written and produced. You can purchase them here. This allows me to give you the information you deserve easily and clearly. My workbooks and videos are available digitally on demand for a small fee. Once you’ve paid for your materials through the shop you will be sent an email that gives you links to your download or the same links will be in the shop after your order goes through. These are available immediately after purchase. Dvds have to ship and take a week or more to arrive at their destination. The dvd files are larger than the digital downloads and of higher quality. The compression we use to distribute the digital files easily means they are smaller and compressed more for ease of download. The best deal is to purchase all of what we currently have available as we give a discount for a bulk purchase. If you’re having problems downloading your materials you can contact Robert@RobertGardnerWellness.com for assistance.